will show you a list of actions that you can take with that content. 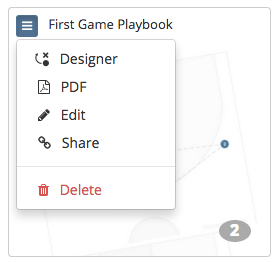 The number at the bottom right of each thumbnail shows the number of players in a play or formation and the number of plays in a playbook respectively. 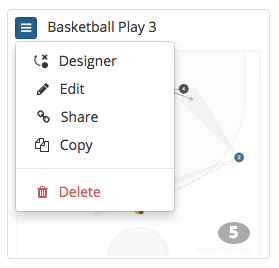 Choose the sport, number of players, and play side using the menus at the top right of the page and search for content by using the search field at the bottom-left of the page to find content by name or tag. Control how many records appear on each page with the menu next to search and navigate between pages using the pagination controls at the bottom right.